Israeli food is trending everywhere in the U.S., from Los Angeles to New Orleans to Philadelphia and New York City. New restaurants keep appearing, chefs from Israel continue to open outposts like Breads Bakery and Nur NYC, and Israeli dishes like shakshuka, hummus and labne are appearing on menus far and wide. And now a new import from Israel is making a debut: kubbeh. Kubbeh sounds like kibbeh, a fried bulgur dumpling typically filled with meat, but it is something altogether different, and far more rare to find. Kubbeh is an Iraqi soup. The broth can be made in various ways, though it is most common to have a sweeter, red version made with beets and a sour, green version often made with okra. The dumpling are made of semolina flour and are boiled. They are both pillowy and dense, filled most often with meat, and absolutely delicious. 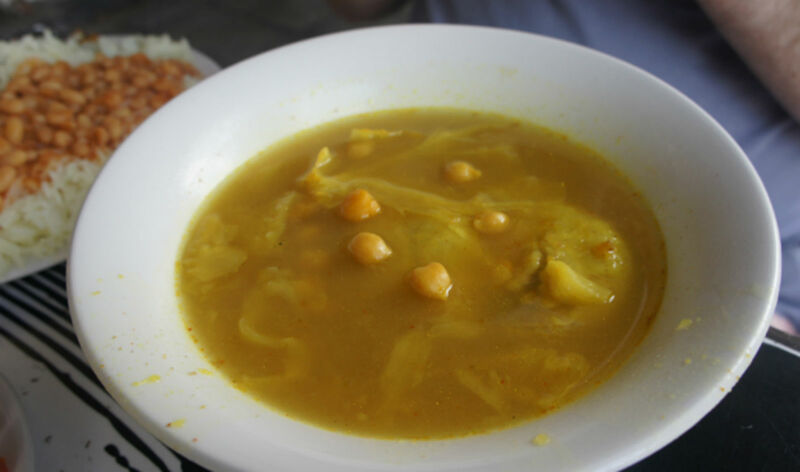 I first tasted kubbeh soup three years ago in Tel Aviv at a restaurant that has since closed called The Kubbeh Shop. My husband and I felt like culinary pioneers, traversing the streets of Tel Aviv at the suggestion of a friend, in search of this coveted Iraqi comfort food that was largely foreign to American Jews. We ordered several kinds of soup and lots of salatim (salads) to accompany, and it was unique and delicious, though admittedly a tad heavy for a steamy afternoon in Tel Aviv. Around the same time as my first kubbeh soup experience in Tel Aviv, The Kubbeh Project, brainchild of Naami Shefi, was rocking the worlds of New Yorkers with a taste of the beloved Iraqi soup in an effort to preserve this time-honored dish. The Kubbeh Project hosted pop-up dinners for a month in Manhattan, but was a short lived taste. The good news is that over the past few years, several Israeli restaurants in the U.S. have started serving up traditional kubbeh. Gila’s Nosh in New York City is serving two kinds, red tomato stew and sour green vegetable, both served with beef and herb dumplings. Meanwhile in Los Angeles, Darna Mediterranean Restaurant is also serving two kinds of kubbeh, though only on Wednesdays. And according to Grub Street, New York City is getting a new kubbeh-specific restaurant from New York native chef Melanie Shurka. The restaurant, slated to open later this month, will be more in the style of the first kubbeh restaurant I visited in Tel Aviv: pick your dumpling, pick your broth and enjoy your custom kubbeh. But don’t mistake this for fast food: Kubbeh is a time-intensive labor of love that requires patience and serious kitchen skills, with each dumpling carefully hand rolled to achieve the perfect consistency.